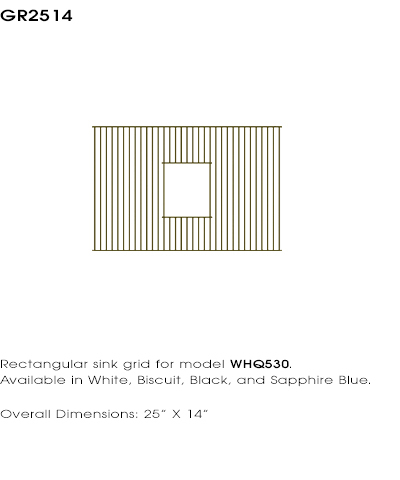 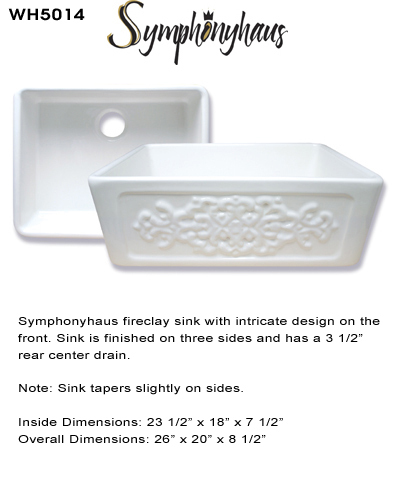 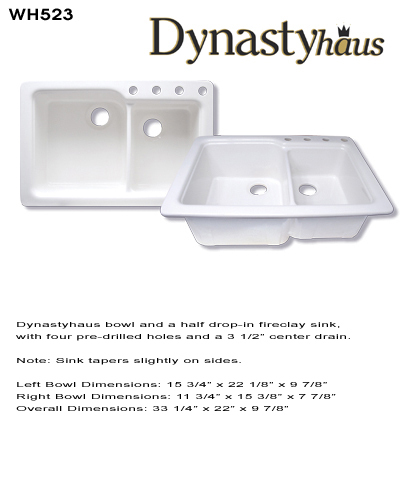 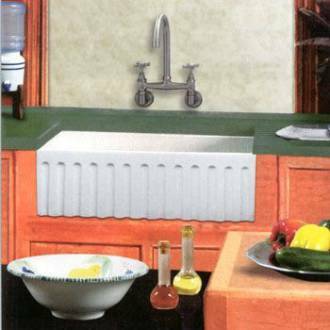 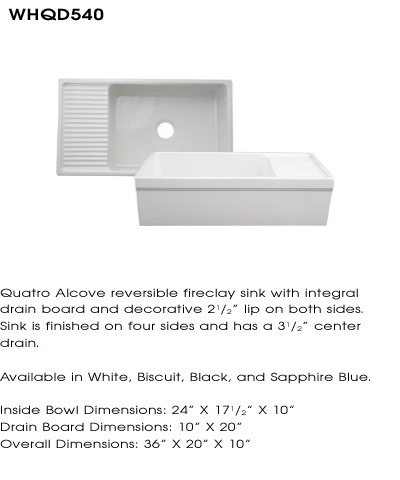 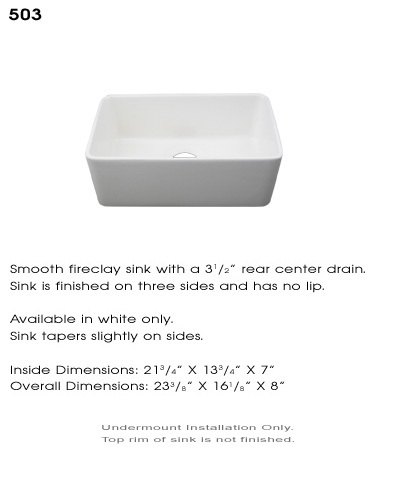 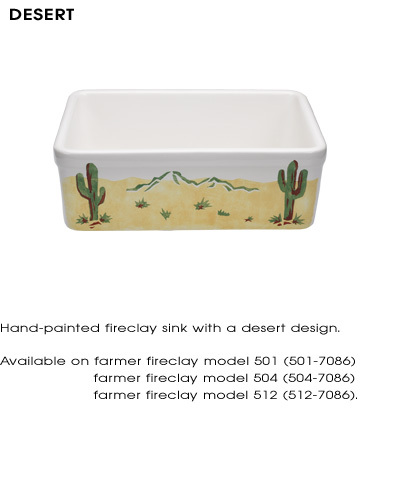 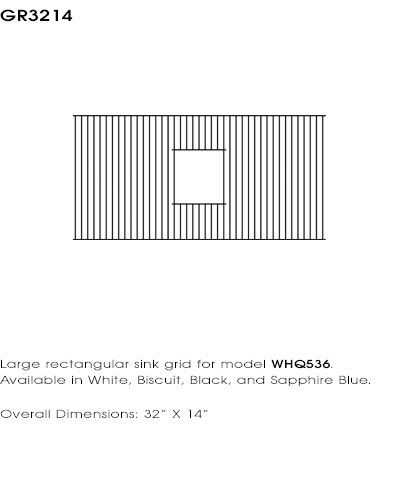 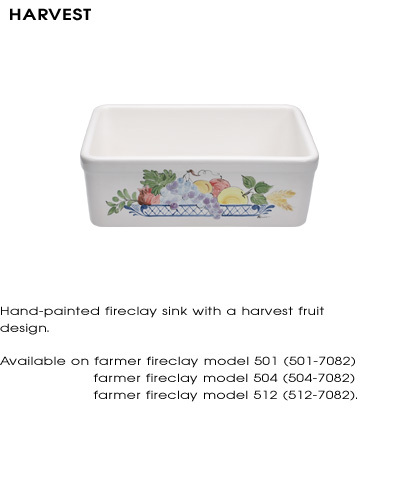 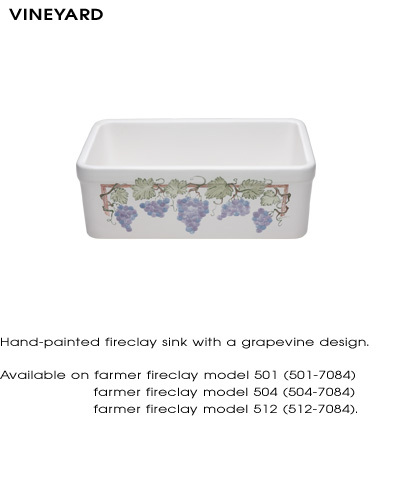 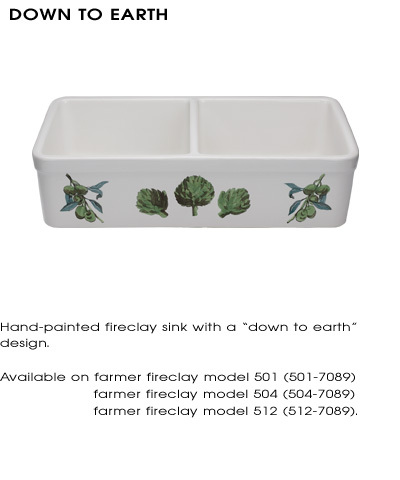 Whitehaus Collection Fireclay Sinks are individually hand finished to ensure the highest quality and durability. 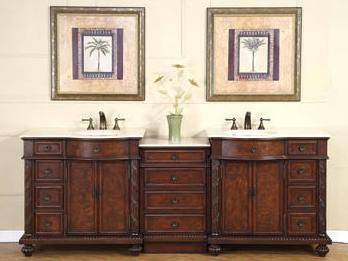 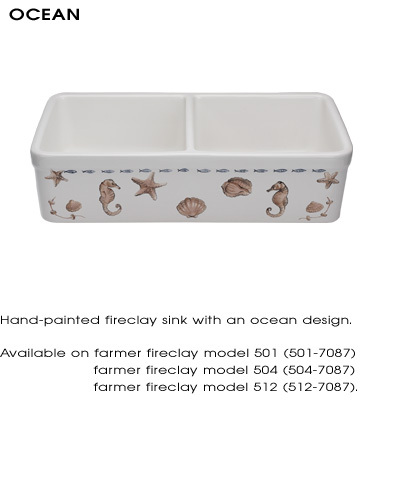 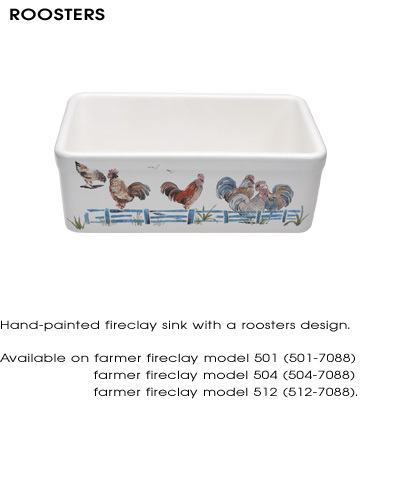 The anti-bacterial glaze is scratch, stain, and burn resistant. 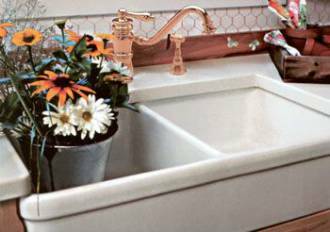 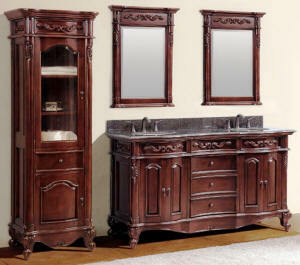 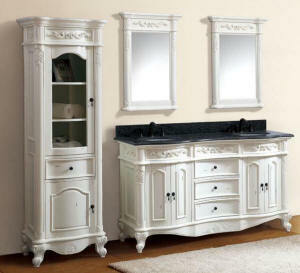 The decorations shown below can be applied to most of the sink models on this page. 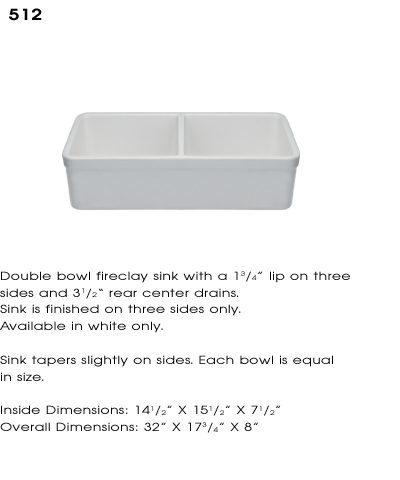 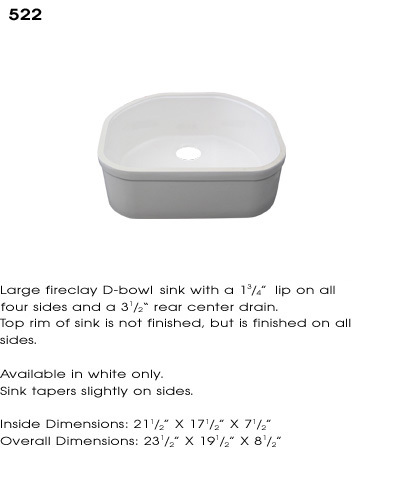 26" x 20 1/4" x 9"
23 7/8" x 16 1/8" x 8"
19 3/4" x 16" x 7"
Large, double bowl sink with a 1 3/4" lip on all four sides. 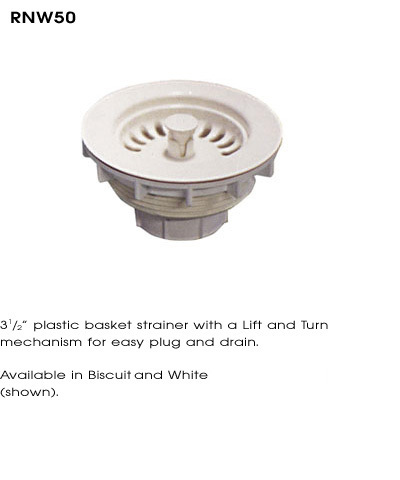 Has 3 1/2" rear center drains. 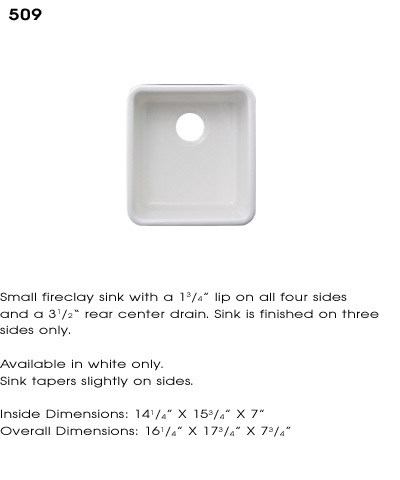 31 1/2" x 17 3/4" x 8"
Large, single D bowl design undermount sink with a 1 3/4" lip all the way around. 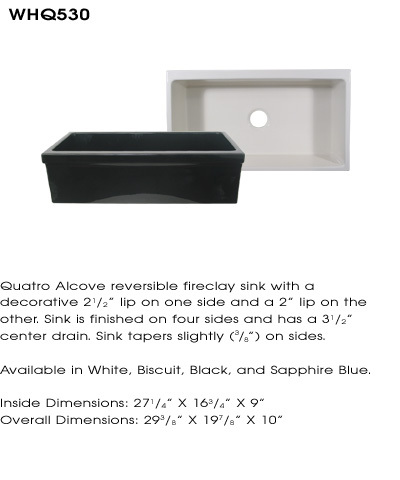 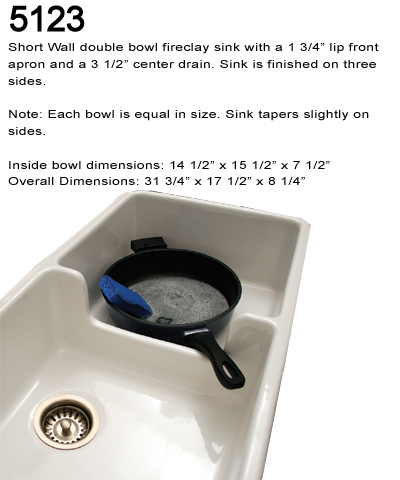 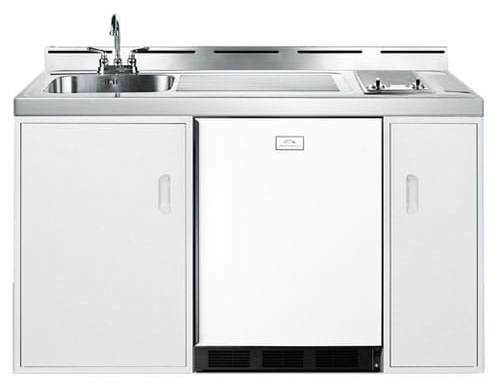 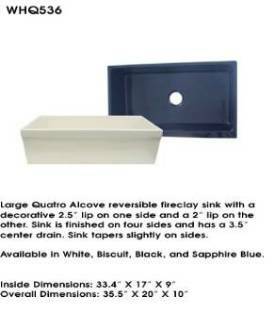 OD: 23 1/2" x 19 1/2" x 8"
Large, single bowl sink with a 2" lip on two sides with a fluted front design. 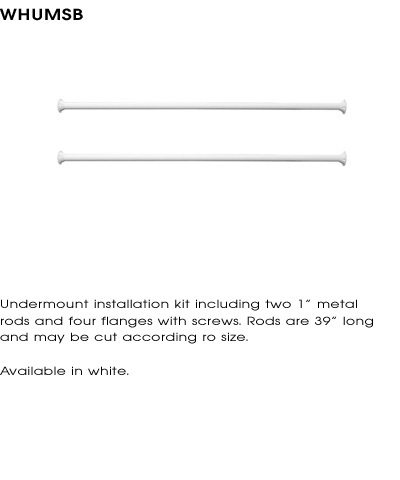 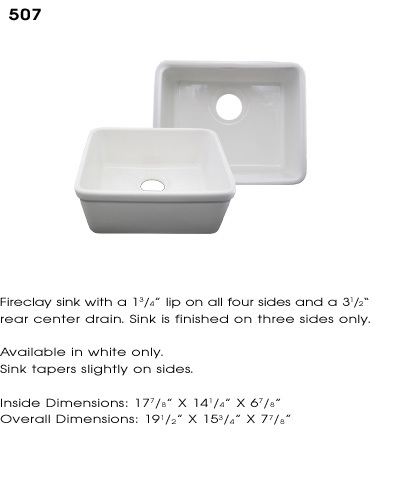 14 1/2" x 15 1/2" x 7 1/4"
32" x 17 3/4 x 7 3/4"
28" x 17 3/4" x 9 1/4"
30 1/4" x 19 7/8" x 10"
15 3/4" x 22 1/8" x 9 7/8"
11 3/4" x 15 3/8" x 7 7/8"
33 1/4" x 22" x 9 7/8"
23 1/2" x 18" x 7 1/2"
26" x 20 1/4" x 8 1/2"
27 1/4" x 16 3/4" x 9"
29 3/8" x 19 7/8" x 10"
33 3/8" x 17" x 9"
35" x 20" x 10"
8" x 17" x 9"
35 1/2" x 19 1/2" x 10"
31 3/4" x 17 1/2" x 8 1/4"
Raised panel design fireclay sink with a raised panel front apron. 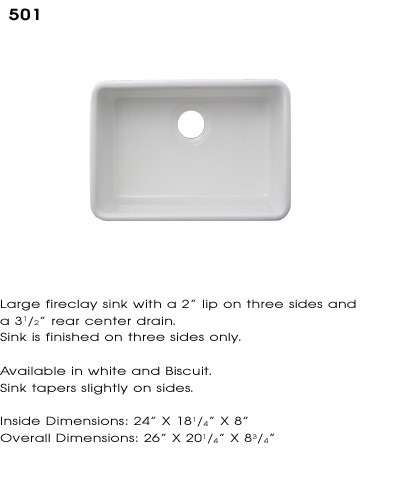 May be installed as above mount or front apron sink. 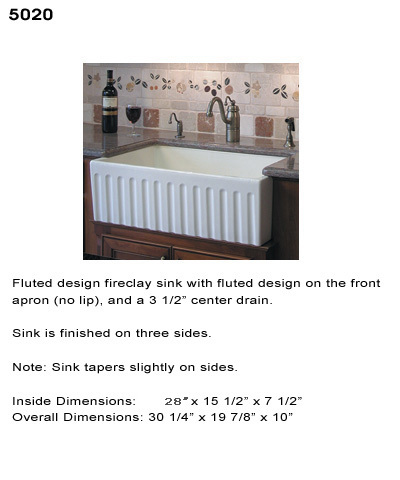 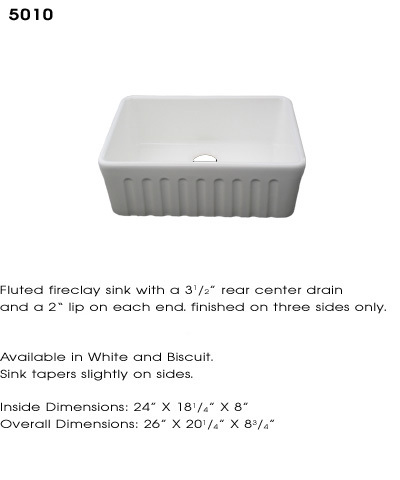 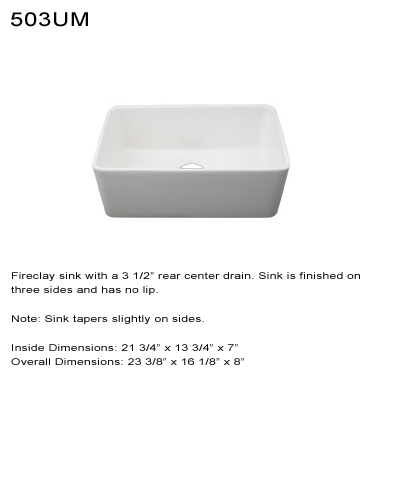 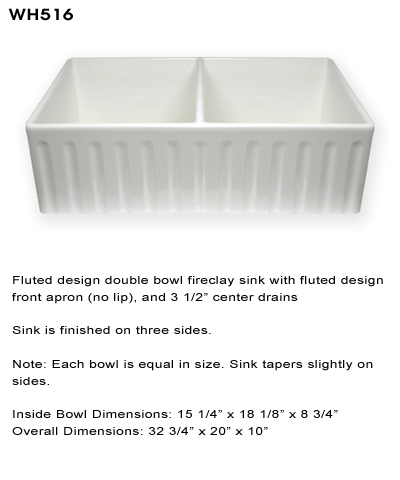 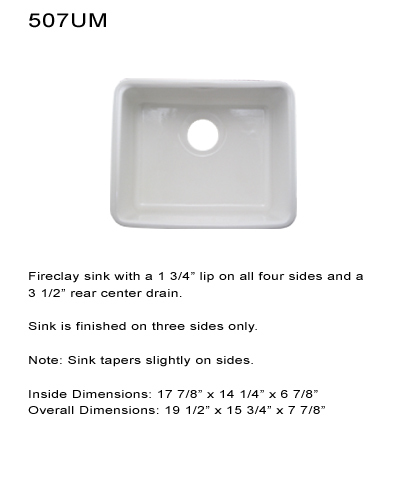 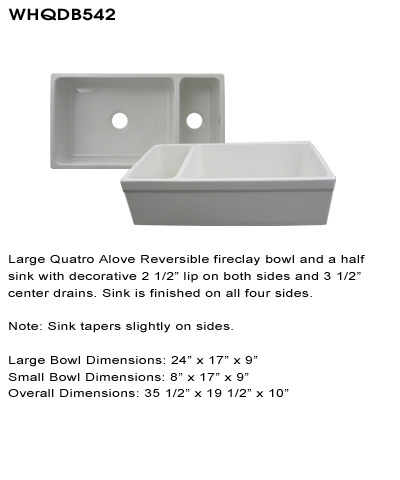 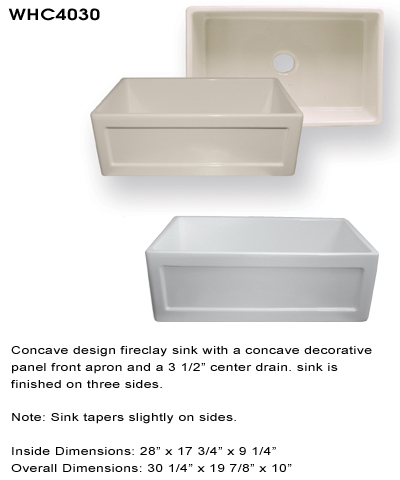 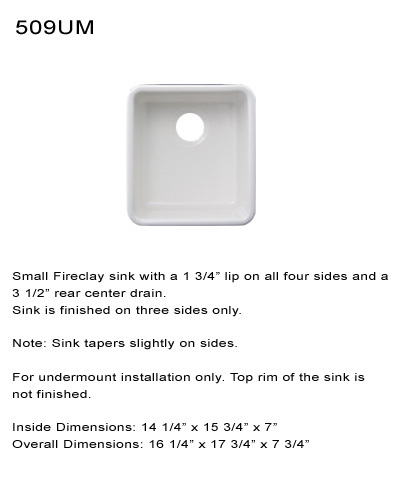 Fireclay sink: 1 3/4" lip on all four sides. 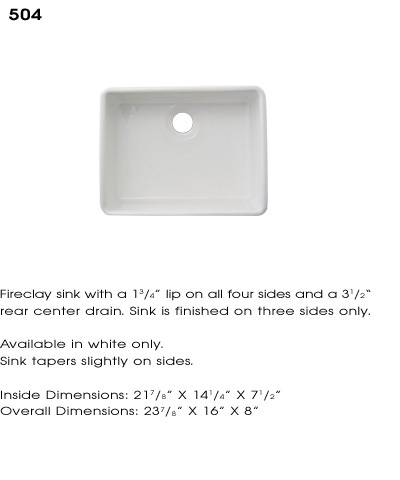 17 7/8" x 14 1/4" x 6 7/8"
19 1/2" x 15 3/4" x 7 7/8"
ID: 21 3/4" x 13 3/4" x 7"
OD: 23 3/8" x 16 1/8" x 8"
ID: 14 1/4" x 15 3/4" x 7"
OD: 16 1/4" x 17 3/4" x 7 3/4"